Two 19-story towers boast 690 rooms including remodeled Petite Suites, Jacuzzi Suites, non-smoking rooms and rooms in compliance with ADA requirements. Valet parking, 24-hour bell service and same-day dry cleaning and laundry services are available for your pleasure and convenience. Room service is available 5am-12am midnight daily. 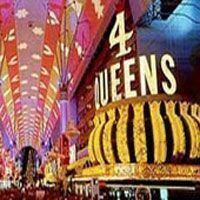 Four Queens Hotel & Casino also has Tix 4 Tonight (a discount show ticket outlet), free entertainment on Fremont Street and in room High Speed Wireless Internet Access. The Four Queens offers 690 beautiful and spacious rooms at reasonable prices. We offer standard rooms, smoking and non-smoking, with either a single king-size bed, two double beds, or two Queen-size beds. Deluxe accommodations include Jacuzzi Suites, that can accommodate four guests. The suites include a king-size bed and a separate area furnished with a fold-out sofa. Also available are spacious Petite Suites that include a king-size bed, as well as a comfortable sitting and dining area. Deluxe Suites include the convenience of a refrigerator and a wet bar. The Four Queens Hotel and Casino offers the very best in gaming excitement! Enjoy our traditional favorites such as single deck blackjack, roulette, craps (with 5 times odds), and keno. Or try something new and exciting such as Blackjack, Three Card Poker, Fortune Pai Gow Poker, Texas Hold'em Bonus Poker, Blackjack Switch, or Let-it-Ride. Plus, we have rows of the newest and loosest slots and video poker featuring up to 100.1% payback*. The Four Queens proudly offers the most popular Megajackpots such as Millioniser, Cash for Life, Megabucks, Penny Megabucks, Zorro, and Wheel of Fortune. We also feature the most popular penny slots. The Four Queens offers Silver Strike machines with collectible silver tokens. Slot players earn additional CA$H and Comps by joining the Royal Players ClubTM and members 55 plus years receive special discounts throughout the casino. Indulge your appetite with the Epicurean delights of award winning HugoÂ’s Cellar, Voted Best Gourmet Room since 1991 by the Review Journal. Enjoy scrumptious Meals served 24 hours from MagnoliaÂ’s Veranda. Or relax in Chicago Brewing Company and Cigar Lounge, where you have a choice of awardwinning handcrafted micro-brews, along with unique selection of appetizers, pizzas and entrees. All in a fun and relaxing atmosphere. Four Queens also offers Subway Sandwich Shoppe, Noble RomanÂ’s Pizza and Dreyer's Ice Cream. Four Queens Hotel & Casino Las Vegas has meeting and banquet space fit for Royalty. When you choose the Four Queens for your next meeting, you are sure to receive the Royal Treatment. Four Queens Hotel & Casino has a friendly, professional staff ready to assist you throughout the planning process. Four Queens' spacious Royal Pavillion can accommodate up to 275 guests with theater seating, and up to 150 with table seating. Hugo's Cellar may also be used for small gatherings in the morning or afternoon. Whether you are planning a training seminar, association meeting, Christmas party, wedding reception or theme party, Four Queens can help.